The United States approach to the Indo-Pacific focuses on three vital areas- Economic, Governance & Security - is a ploy to establish hegemony. In the name of enhancing shared prosperity USA wants to enter into this region like Middle East so-called "The Arab Spring". This time slogan is "Advancing a free and open Indo-Pacific Region." The United States is taking a whole-of-government approach to advance fair and reciprocal trade, promote economic and commercial engagement that adheres to high standards and respects local sovereignty and autonomy, and mobilize private sector investment into the Indo-Pacific. During the Vice-President's trip to the region, the US announced initiatives and partnerships that put the US and the region on a strong path to expanded cooperation in the coming years. Vice-President Pence highlighted the BUILD Act, which President Trump signed into law in last October. The BUILD Act establishes a new US International Development Finance Corporation that doubles U.S. development finance capacity to $60 billion. This historic development will ignite more opportunities for partnership in the Indo-Pacific. The US Overseas Private Investment Corporation (OPIC), the Japan Bank for International Cooperation (JBIC), and Australia's Department of Foreign Affairs and Trade (DFAT) and Export Finance and Insurance Corporation (EFIC) signed a Memorandum of Understanding to advance cooperation in mobilizing private investment in the Indo-Pacific. At the Asia-Pacific Economic Cooperation (APEC) Economic Leaders Meeting, the US launched this year US-Support for Economic Growth in Asia (US-SEGA) technical assistance program. US-SEGA, a five year program with an initial tranche of $9 million in US funding, will build capacity in APEC economies to adopt high-standard, comprehensive trade and investment policies that promote fair trade, open markets for U.S. businesses, and increase economic growth throughout APEC and the Indo-Pacific region. The United States will advance US economic priorities at the APEC Economic Leaders' Meeting relating to the digital economy, structural reform, women's economic empowerment, and services trade. The Department of Commerce announced that its largest trade mission, Trade Winds, is dedicated this year to the Indo-Pacific, as part of Access Asia - a series of 25 events to connect American firms with opportunities in Indo-Pacific markets. Good governance is a core pillar of the US vision for a free and open Indo-Pacific. The United States is committed to working with Indo-Pacific nations to create the conditions needed to unlock greater private investment, combat corruption, and secure nations' autonomy from foreign coercion. The US will continue to promote transparency, openness, rule of law, and the protection of human rights and fundamental freedoms, as the US has continuous and ongoing programs supporting these goals.' As the Vice President emphasized, the investments in these areas total over $400 million over a two-year period. On November 17, the Vice-President announced an Indo-Pacific Transparency Initiative that will direct our investments in this space to advance shared goals in the region. This initiative will promote sound, just, and responsive governance through efforts to counter corruption while encouraging strong civil society, responsible borrowing, honest procurement and contracting practices, and judicial sector and legal reform, among other aims essential to good governance. The United States is proud to share these goals with many allies and partners, including ASEAN, whose charter calls for "a regional architecture that is open, transparent, and inclusive." The Indo-Pacific Transparency Initiative provides an elevated platform for expanding cooperation with our allies, partners, and regional institutions to advance these shared principles. The United States will work to identify collaborative opportunities to strengthen governance practices in the Indo-Pacific, both bilaterally and through regional mechanisms including ASEAN, APEC, the Pacific Islands Forum, the Lower Mekong Initiative, the Bay of Bengal Initiative for Multi-Sectoral Technical and Economic Cooperation, and the Indian Ocean Rim Association. The US is deepening cooperation across the Indo-Pacific to confront common threats, protect shared resources, and uphold sovereignty. It is working hand-in-hand with the region to denuclearize North Korea, safeguard navigational rights and freedoms in the East and South China Seas, and prevent the spread of terrorism and violent extremism. American security and prosperity depends on a free and open Indo-Pacific, and the US will continue to work with any nation, large or small, to advance that vision now and for future generations. During the Vice-President's visit, the US and Japan announced delivery in 2018 of ten F-35As, valued at $1.38 billion, under Foreign Military Sales program, with six more to be delivered in 2019. Overall, US companies made $9.42 billion in direct commercial sales of defense goods and services in the Indo-Pacific region over the past year. The US is providing more than half a billion dollars in security assistance to Indo-Pacific nations this year - more than double the previous year. This includes Secretary Pompeo's announcement at the ASEAN Regional Forum in August of nearly $300 million in assistance to strengthen maritime security and domain awareness, humanitarian assistance and disaster response (HA/DR), and peacekeeping capabilities, as well as to counter transnational crime. The US is also expanding maritime security cooperation in the Indian Ocean region, including through the new Bay of Bengal Initiative, and extending maritime security, HA/DR, and peacekeeping programming to the Pacific Islands. China's Belt and Road Initiative (BRI), commonly known as One Belt One Road (OBOR), offers transformative opportunity in promoting global connectivity and regional economic integration. Together with China's massive engagement abroad in terms of trade, investment, contracts and in political relations, the BRI constitutes a geopolitical grand strategy that creates both challenges as well as opportunities for South Asia. China already has strong economic relations with each of the countries in South Asia, with a huge trade surplus and massive investment and robust involvement in construction of big projects in each country. For South Asia, economic incentives available from the BRI outweigh its geopolitical or strategic dimensions, though they may undermine its economic benefits. However, the BRI's success will depend upon how the perceived or real strategic and geopolitical objectives and apprehension of the increasing Chinese footprint in each of these countries are addressed in a transparent and accommodative manner. Together with emerging issues in global governance, the environment of uncertainty, including the disarray in multilateralism, superpower rivalry, backlash against globalization, return of geopolitics and emergence of protectionism and trade war can also affect the success of the BRI. Does BRI complement "globalization" or seeks to counter it? Can the BRI become an alternate model for "benign" and inclusive globalization? 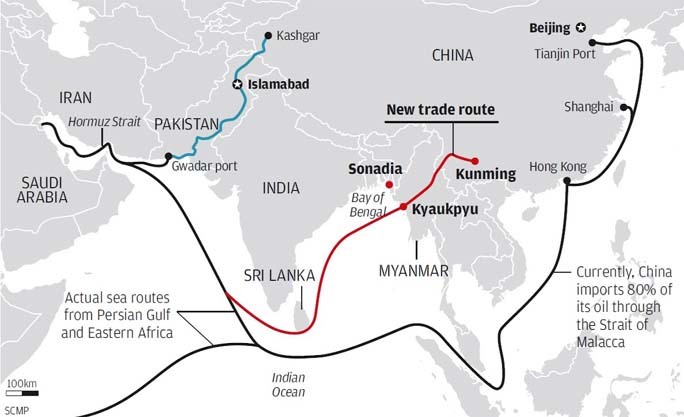 How should the countries in South Asia respond to rise of China and its alternative model for globalization, global governance, economic integration, connectivity, trade and investment that BRI wants to introduce? What are the factors that may hinder or add to the success of BRI? How do we avoid geopolitical and strategic implications and risks and challenges associated with the BRI in South Asia? What China and the participating countries need to do to make it work? America & China are involved in superpower rivalry in South Asia. A distinguish French Social Scientist. Mme Christianne Hurting declared: "The United States is not a country. It is an idea. And, the idea is how to make money." The Present Day World is changing every day and every moment 20th century was not the replica of 19th Century. Twenty First Century is quite different. At present science, Technology & War Industries have developed so much which could not be developed or think of last few centuries. Moreover, connectivity by road, sea Air, specially internet connectively developed so much we can reach any corner of the global in a moment. Present day world is facing a new problem of International Terrorism, now it is known as Global Terrorism. A new phenomenon has developed like religious terrorism. In my humble way I tried to write about the crises of Advancing a free & open Indo- Pacific Region and One Belt One Road Initiative & the future of globalization. American interference from Vietnam, Cuba and recently Middle East had proved to be counterproductive. The days of Imperil Dominance had gone long ago. The present day world will not tolerate the dominances of dollar & America or any other country's interference; specially war. NATO alliance is struggling militarily under US leadership. But there is no doubt that NATO will die down like WARSAW Pact. Peace loving and democratic well-meaning people around the globe want no war and are lasting for Terrorism free, and Nuclear weapons of mass destruction free humane world order.